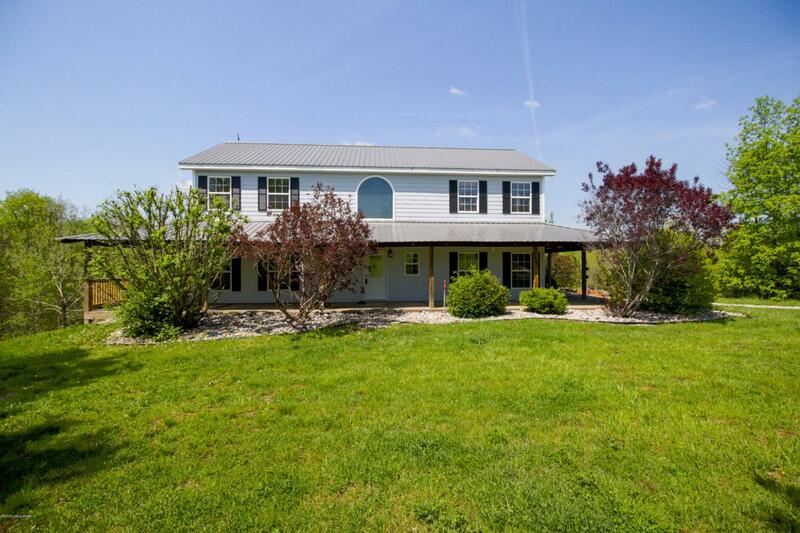 42 Acre Oldham County Horse Farm.....You will enter thru your private electronic gate and drive down the long lane to your dream property. The home is over 2200 sq ft, with a first floor master suite, first floor laundry, great room, large eat-in kitchen and 3 additional bedrooms plus a loft and full bath upstairs. The finished walkout basement has a bedroom (with large window), full bath, family room with bar area and another large hobby area. Finally the home is surrounded by a wrap around concrete patio on all 4 sides of the home. You will also appreciate the GEO Thermal system in the home to control electric bills and the metal roof also reduces future maintenance. Outside there are 36 acres in Oldham County and 6 in Henry County, making up the total of 42 rolling acres.Other features include an in ground pool, pond, sand training ring and lots of 4 board fencing and trails to explore. There is also a 3 plus car detached garage and a 3-car carport. The 7-stall horse barn has its own electric, water, furnace and hot water heater plus above the barn is a large 3-bedroom apartment with kitchen, full bath and 2 living areas. There is also a tack room in the barn. An HMS 1 Year Home Warranty is included for the buyers! BE SURE TO CHECKOUT THE FULL WALK THRU VIDEO IN THE PHOTO TAB and call today to schedule your very own private showing ! !